Fred Robertson of the United State Attorney's Office, Kansas City, writes the secretary to Governor Arthur Capper, Charles H. Sessions in response to a letter he received. The letter acknowledges receipt of a letter from W. A. Lewis of Pence (Scott County), who is alarmed by the behavior of a German neighbor. During World War I, citizens suspicious of the patriotic allegiances of their neighbors often sent reports of such suspicions to the Governor. The Governor's Office often forwarded these reports to the United States District Attorney for investigation. 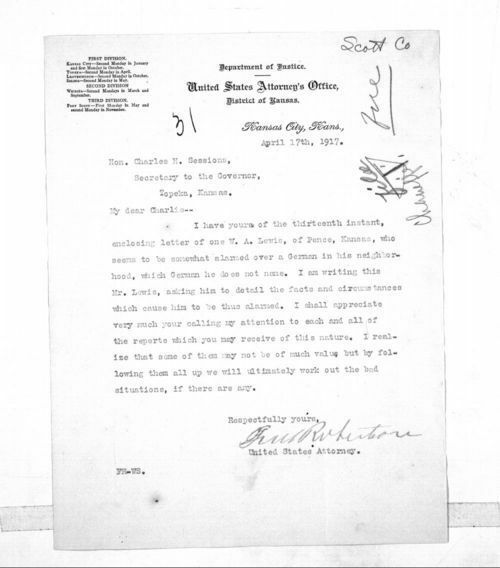 Robertson's letter to Sessions can be used in conjunction with other material (#207797) to help students appreciate the level of anti-German sentiment that permeated Kansas, and the U.S. in general, during World War I.